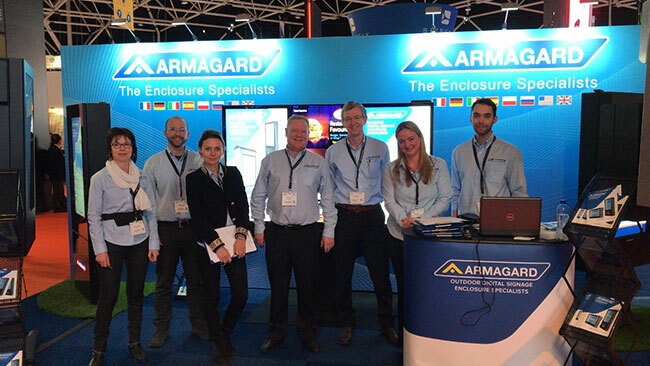 Integrated Systems Europe 2019: Armagard’s Annual Preview | Armagard Ltd.
Visit outdoor digital signage enclosure specialists, Armagard at the Integrated Systems Europe 2019 exhibition in Amsterdam, Netherlands. Find us on stand 8-E210. 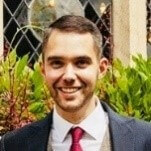 2019 marks Armagard’s eighth year in attendance at ISE, having made our first appearance back in 2012. The tradeshow has proven to be very successful for Armagard, enabling the company to raise awareness of its products, the business brand and develop key customer relationships on an international scale. 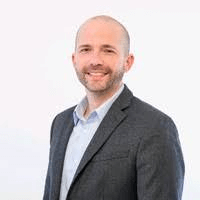 Eight Armagard digital signage protection systems, including a range of brand new products, will be on display at this year’s ISE, featuring a mix of outdoor, indoor and industrial digital signage solutions. 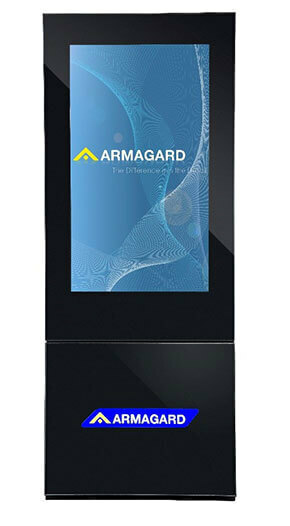 Armagard’s brand new, Samsung QSR Totem Enclosure, exclusively for Samsung screens. A single or dual screen enclosure system, the drive thru digital kiosk is a unique, slim-profile unit designed exclusively for Samsung outdoor OH46F and OH55F high bright screens (2,500 NITS). The unit has an IP56-rated lower compartment equipped with state-of-the-art, climate control technology to regulate airflow, temperature and power. With official design approval from Samsung Korea, the system is available as an enclosure only option or with the Samsung OHF 46" or 55" screens provided. The enclosure is simple to install. Two people can assemble the enclosure on site or it can be crane lifted into position using an eye bolt on top of the unit. Designed specifically for the 3rd generation iPad pro with a 12.9" screen, plus the Brother QL-810W label printer, Armagard’s new kiosk system is a check-in and badge printer solution, for indoor locations. 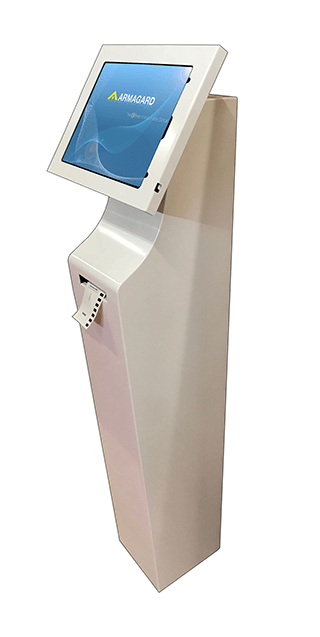 Ideal for visitor entrances, waiting rooms, hotel lobbies and more, the digital kiosk is available in a desktop or floorstanding design. A schematic for Armagard’s new, kiosk enclosure system. Highly secure and stylish, the kiosk enclosure brings tablet technology to key locations, improving customer engagement and operational efficiency across your business. Equipped with two security mechanisms, the integrated iPad pro is locked in place, reducing the risk of theft. The high-speed, Brother QL-810W label printer connects with the iPad tablet via USB or Wi-Fi. It’s easy to setup and use. 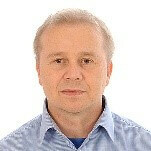 To design and print labels, connect the printer to the tablet to launch the software and enable the advanced print mechanism. 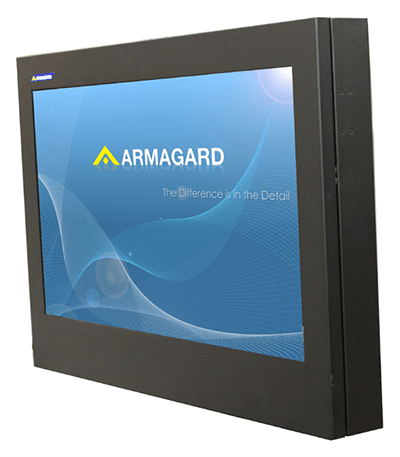 The stainless version of Armagard’s 55" landscape LCD enclosure is manufactured from food grade (316) stainless steel, and provides additional protection benefits when compared with Armagard’s powder coated model. Most notably, this unit is suitable for daily washdown cleaning, and features enhanced corrosion resistance. Primarily designed to maintain hygiene standards in food manufacturing, medical environments and pharmaceutical labs, the stainless steel LCD enclosure is available with a polycarbonate viewing window (10 times stronger than glass), which is shatterproof, reducing the risk of contamination where smashed glass would be a hazard. 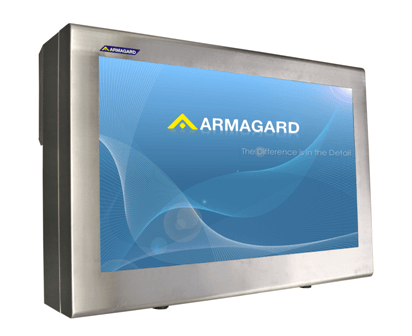 Armagard’s, 55" stainless steel digital signage enclosure. With its unique aesthetic appearance, the semi-outdoor stainless steel enclosure combines eye-catching design with reliable performance to deliver effective screen protection, while giving your staff a clear digital messaging channel. Meanwhile, the addition of gas struts enables the enclosure to open vertically for easy accessibility, giving end-users the freedom and flexibility to upgrade AV hardware quickly and with minimal disruption. The stainless steel enclosure is sealed to IP54/56/65 industry standards, suitable for light washdown in order to maintain cleanliness standards. Meanwhile, your digital messaging continues to run uninterrupted, where other displays could not! The professional, monolith totem enclosure is a new addition to the Armagard range, equipped with a host of features that improve performance and appearance. 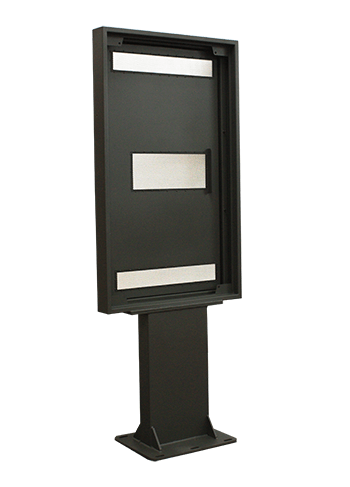 The 55", standard monolith totem system is reliable, robust and low maintenance. Armagard’s, 55” monolith totem enclosure. With an all steel design, the unit has a distinctively professional look. Meanwhile, the addition of gas struts to the upper compartment enables the enclosure to open vertically for easy accessibility, giving end-users the freedom and flexibility to upgrade AV hardware quickly and with minimal disruption. Available as an enclosure or a ‘complete solution’, this unit comes with the option to include a professional high bright display, and network media player, alongside optional colour branding (customisation). Fully outdoor-ready, the standard 55", monolith totem system can keep screens operational in temperatures ranging from -5°C ~ 35°C. Display content like a page from a book with the outdoor, portrait flat panel enclosure from Armagard. Perfect for those slimmer wall areas, engage customers outside of your establishment, and increase footfall and sales from promoted items. The 42", standard portrait enclosure is manufactured using powder coated mild steel for enhanced durability. Sealed to IP54/56/65 industry standard, the enclosure is fully outdoor-ready and defends screens against heavy rain, dust, extreme temperatures, and electrical surges. Portrait enclosures excel as information boards, making them ideal for a range of applications where text based advertising is often in use, such as transport shelters, store fronts and sports venues. Ideal for customers who need to scan and read information quickly, a portrait enclosure is the perfect format for ensuring the effective delivery of critical information, without disruption. 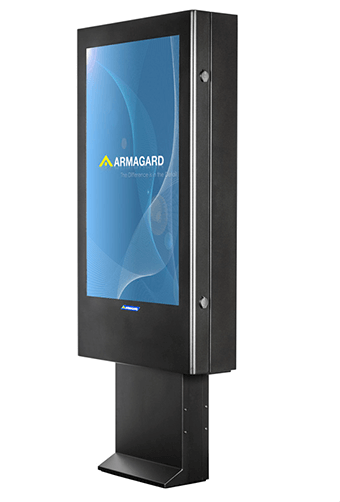 Armagard’s iconic, standard totem enclosure is a freestanding design used to protect 32" and 47" screens used outdoors. Sealed to IP54/56/65 industry standard, this outdoor enclosure is highly versatile, making it suitable for a wide range of applications including retail, drive thru restaurants, transport hubs and more. This state-of-the-art system provides cost-effective hardware protection for up to a decade, allowing you to swap, change or upgrade interior hardware quickly, unlike restrictive and expensive (all-in-one) outdoor systems. Armagard’s standard totem enclosure for 32” and 47” displays. 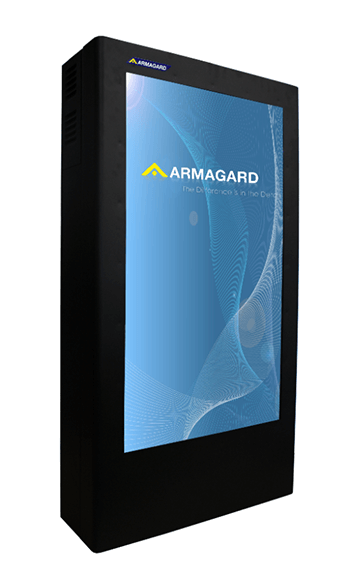 Armagard’s landscape LCD enclosure is a definitive piece of digital signage hardware, perfect for entry level installations, right through to large scale outdoor networks. This protective outdoor enclosure is sealed to IP54/56/65 industry standard, providing a shield against heavy rain, dust, extreme temperatures, high impact forces and electrical surges. The LCD landscape enclosure is compatible with most commercially or professionally made display types. Screens can be installed quickly using the universal VESA mounting system, while leaving enough additional space to fit a separate media player or micro-PC. Fully outdoor-ready, the landscape enclosure display comes complete with anti-reflective glass and keeps screens operational in temperatures ranging from -30°C ~ +35°C. The unit has a clam shell design, enabling the enclosure to open vertically, allowing for a lone technician to upgrade hardware without compromising personal safety. The professional, slimline LED screen enclosure is a new addition to the Armagard range, with an aesthetically enhanced appearance. Sealed to IP54, 56 or 65 for indoor and outdoor use, the enclosure is equipped with the latest climate control technology, which reduces the risk of screen damage caused by temperature fluctuations ranging from -30°C ~ +55°C. 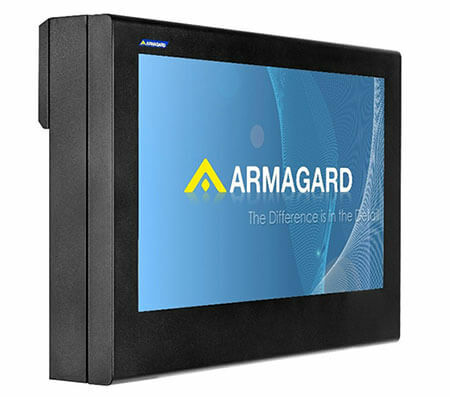 Armagard’s new, slimline LED display enclosure. The solid and watertight powder coated mild steel chassis, prevents the ingress of water and dust, while protecting screens from acts of vandalism and attempted theft. With a viewing window coated with anti-reflective technology, the enclosure reduces solar load, preventing screen burnout, while improving visibility. The new generation design delivers improved temperature management and airflow efficiency, while a lighter structure allows for a smoother installation. To learn more about Armagard and to see our digital signage enclosures in action, visit us on stand 8-E210. 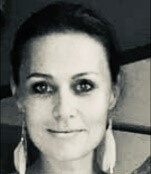 We look forward to meeting you and hope you enjoy ISE 2019.